The founder of Brandon Raynor’s School of Massage and Natural Therapies School, Brandon Raynor, has taken his 23 years of massage and Naturopathy training, knowledge and experience and created five day, intensive massage courses. The 5 day Raynor Massage Certificate Course and the 10 day combined Raynor Massage Certificate and Diploma classes are held in Auckland and Christchurch in New Zealand on a regular basis since 2003. Brandon Raynor will be personally teaching a course in Auckland in December 2017. His knowledge in the healing arts ranges from Shiatsu to Thai massage, Hawaiian massage, Ayurvedic massage, Chinese medicine, yoga and Naturopathy. Brandon Raynor has then incorporated the most prominent massage techniques from each of these practices to create his own massage style known as Raynor Massage. In these courses you will be emerged into a hands on training whereby the instructor will give a demonstration to be followed by students taking turns practicing the massage techniques on each other. During this time a Raynor massage instructor will provide constructive feedback on your techniques, thus allowing you to be competent and confident in Raynor Massage in a short duration. 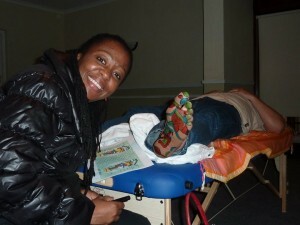 Many students also find receiving Raynor Massage throughout the course very healing for their own personal journey. Raynor Massage practitioners are innovators and leaders in the field of massage therapy with thousands of satisfied Raynor massage clients all around the world. A key component to Raynor Massage is to address the individual needs of each massage client. In this way, Raynor Massage varies from a typical, regimented massage that is generally structured the same for every person. To do so, we will teach you how to develop and trust your intuition, sense of touch, and how to work in conjunction with the client’s breathing pattern to release blocked energy. Raynor Massage Courses will train you to identify the bands in which the tension is held and how to alleviate it. Common origins of tension are usually held in the abdomen, hands, feet and head and so detailed training on these areas comprises a large part of the Raynor Massage courses. It is quite common for a deep tissue Raynor abdominal massage to help a person let go of emotional tension that had been built up in the body for years, feeling rejuvenated and transformed. Our massage courses in Auckland are held at the Browns Bay Marine Centre in Auckland’s North Shore. There are several good bed and breakfasts nearby and plenty of nice restaurants. Our New Zealand Massage School holds courses over 5 days or 10 days. Click here if you want to read more about the 5 day Raynor Massage Certificate Course. and the 10 day Raynor Massage Diploma Course.